African nations, stung by plunging commodity prices, should set up more sovereign wealth funds to help withstand the next downturn, said Akinwumi Adesina, the African Development Bank’s new president. Adesina replaced Donald Kaberuka at a time when low oil prices threaten to deepen economic crises in Nigeria and Angola, the continent’s largest crude producers, African currencies are trading near all-time lows and stock and commodity markets are reeling after China devalued the yuan this month. 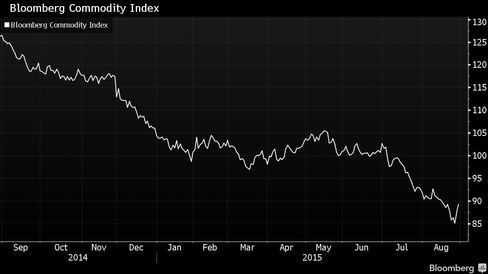 The Bloomberg Commodity Index has fallen almost 30 percent in the past year. The Bloomberg Commodity Index, which tracks 22 raw materials, slumped to its lowest level since 1999 on Aug. 26. The West African nations of Nigeria, Angola and Ghana, also an oil producer, have sovereign wealth funds, while countries including Kenya and Tanzania, in the east, are considering the idea to store savings from oil and gas exports as they develop deposits on a commercial scale. Critics of the wealth funds argue that the revenue can be squandered for political gain by African governments that often aren’t transparent, rather than be invested over decades for future generations, or the money is better spent on immediate priorities, like infrastructure and social programs. The recent fall in Chinese stock market prices was an “asset repricing issue” that isn’t expected to cause greater economic turmoil in Africa beyond the immediate difficulties, Adesina said in an interview on Aug. 28. China has become Africa’s largest trading partner, with the value of trade rising threefold to $166.3 billion in 2012 compared with five years’ earlier. Economic growth in sub-Saharan Africa will probably slow to 3.5 percent this year, compared with an average of 5.5 percent between 2000 and last year, Renaissance Capital economist Yvonne Mhango said in a note on Aug. 28. The outlook has dimmed in Nigeria, where growth slowed to 2.4 percent in the second quarter, from 4 percent a quarter earlier, and South Africa, whose economy contracted in the three months through June. Weakening African currencies have increased the cost of servicing foreign-currency bonds, Adesina said. The bank will promote an expansion of regional borrowing to help countries raise money to build infrastructure and develop more sophisticated industries. “We can do a lot more in terms of domestic resource mobilization that reduces the need to post a lot of foreign currency-denominated bond issuance,” he said.